I have little-to-no knowledge about how the laptop batteries work. I know there is a microcontroller to actually verify the balancing between cells (and in case blow up a fuse or something similar). I was wondering, does the recharge circuit balances cells as well while charging? Is charging procedure the same of the external chargers (diffent CV/CC phases) ? I don't have specific knowledge of any laptop battery charging circuit, but I'd be real surprised if the charger didn't do charge balancing. If you want good life from lithium cells while getting good performance and not catching fire, you really need to manage each cell separately. I did work on a commercial battery backup unit once. There were 8 lithium cells in series. The voltage across each was measured separately. Each cell also had a separate shunt resistor that could be turned on independent of the other cells. During charging, we checked the cell voltages every second, and turned on the shunts around any cell that was above the median voltage. During discharge there is little you can do. There is no advantage to draining the high cells to keep pace with the low cells. You do have to monitor each individual cell voltage, then shut down the whole pack when the lowest one gets to a threshold. To really do this right, you should measure temperature too. 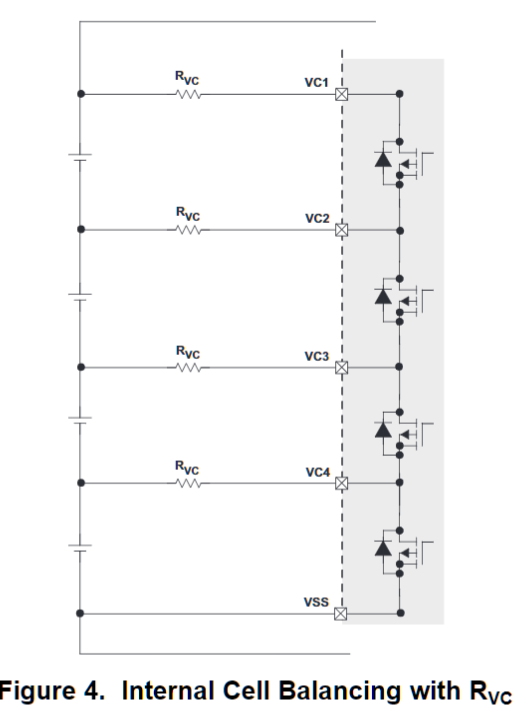 Adjust the full and empty voltage thresholds as a function of that temperature. For more capable cells external FETs can be used, but it doesn't take much to balance internally. The standard CC-CV charging, however, must be applied externally, which is typically located on laptop mainboard itself. Many battery packs have protection switch which must be enabled from mainboard via I2C interface. The interface is usually secured and non-disclosed to public, so some people might think that it has a "blown fuse". Sorry for the late entry. Based on my experience on cracking open a few laptop batteries, this is what I can tell: 1. Laptop batteries have NO balancing (HP, SONY, ASUS, etc.). 2. Yes, they have a fuse that, when is burnt it's because the MicroControler told it to and, from my atempts to revive, there's no way to recover the pack. 3. Again yes, the Laptop charges with CC (first) and then CV just like any other LiIon charger. Not the answer you're looking for? Browse other questions tagged batteries battery-charging lithium laptop or ask your own question. Integrating battery and battery charger with my project - I never want to remove batteries from this device for charging, how do I do that? Is it safe to rebuild my laptop battery pack?